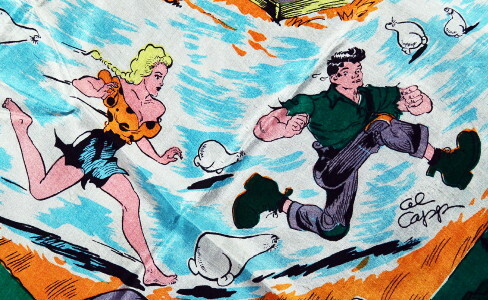 1950's vintage LI'L ABNER square scarf. Kelly green, turquoise and orange silk. Rolled hems. All original 1950's vintage. Li'l Abner was the title character in the long running (1934-1977) syndicated newspaper strip by cartoonist Al Capp. Motif includes Capp characters in the comic strip: Li'l Abner, Daisy Mae, Mammy & Pappy Yokum, Marryin' Sam, Moon Beam McSwine, Wolf Gal, Hairless Joe and Lonesome Polecat AND dozens of those adorable magical SHMOOS (oops--> SHMOON, plural for Shmoo) !! All characters shown racing in circles around DOG PATCH. 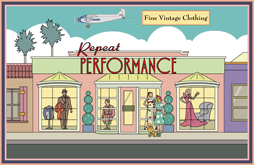 Fabulous cartoon imagery with lotz of action! Excellent vintage condition. Shows some minor pin holes and inconspicuous soil & dye run marks. Strong textile and totally wearable.